What happens when you mix over-ripe Hachiya Persimmon and homemade miso-marinated tofu...? Really tasty appetizer. Just mix the cubed miso-marinated tofu with coarsely-cut persimmon and add some shiso leaves, salt, sesame oil, and sliced dry red chili. 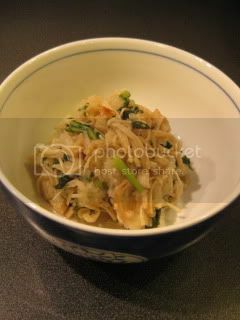 Here's another appetizer...sauteed enoki mushrooms and shungiku (chrysanthemum leaves) with grated daikon in sweet vinegar sauce. 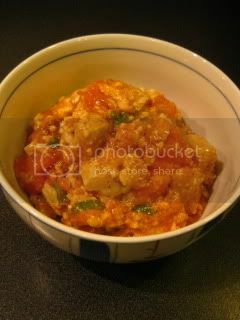 I'm getting tired now, so I try to post the recipe next time.